Since I started noticing bunting a couple of years ago I have been in love with it. All sizes and colours, whether printed on invites or hanging over tables, I have this unquenchable fascination with it. (Not sure if it is on the way out again in terms of trendiness, but never one to completely obey the fashion rules, I will continue to nurture the captivation). 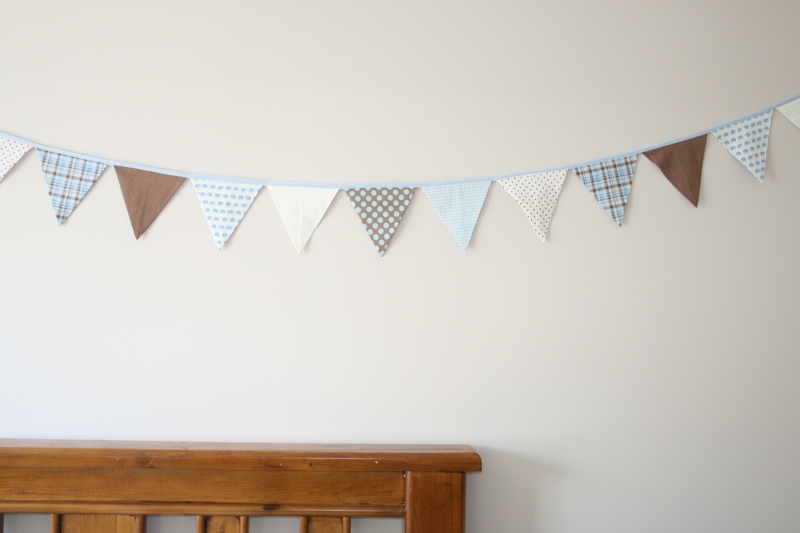 So no surprise that one of the items on the must-make list for the nursery was some bunting. Initially I thought of just making a short strip of flags to hang up against the wall behind the crib (this was when I was still going to have to sew it by hand), but then I bought a sewing machine (more on this momentous event later), now it is going to criss-cross all over the room. So I have ended up with about 10 meters’ worth of bunting, and really enjoyed making it. But as a bit of an anti-climax I will now have to wait until I can actually hang it up. Why? Because we are building a house. For some bizarre reason we thought it would be a good idea to go through two of life’s biggest events (erm challenges…?) at the same time…a (first) new house and a (first) new baby. In fairness, we were hoping (and were promised) to be moved in to the new house by the time baby arrived. But then we have never built a house before. As innocent and impressionable house-building-newbies we dived in with much excitement and anticipation and optimism. But as the anticipated construction date started falling further and further behind so did our enthusiasm. Now we will be happy once the key is actually in our hands. But construction has finally commenced, although we still will not be able to move into the new house for about three months after baby is here, so technically baby doesn’t have a nursery yet and will be slumming it in the spare room until the big move. But nothing wrong with getting everything ready and made now. 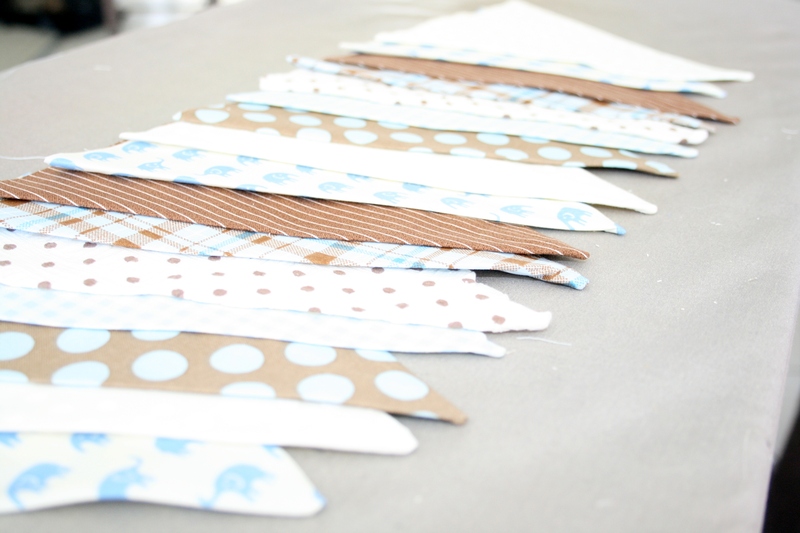 From what I could gather in terms of info and tips, bunting can take as much or as little time as you have to make it. And you don’t necessarily need a sewing machine to make it. If it is just for a one-off event you could get away with cutting single sided triangles with pinking shears (a special pair of scissors that leave a zigzag edge and prevents fraying) , folding the short edges over some rope, attach with double sided sticky tape and be done with it in under an hour. I’ve opted for double sided stitched flags sewn to bias tape, because it will be hanging across the room, both sides will be visible. Plus I’m hoping it will last for at least the first 12 months. I watched two YouTube how-to videos that differed slightly in the way the flags were stitched, although the first was really informative, I decided to go with the second as it looked slightly easier to do on the sewing machine plus she provides a really handy template. 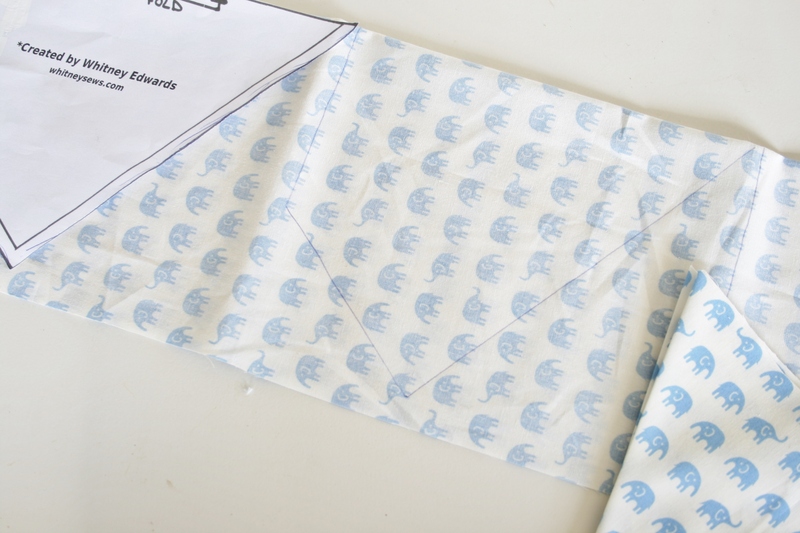 Go check out her lovely blog, Whitney Sews to print a copy of the template. Following are some basic instructions on how I made my bunting, based on Whitney’s pattern template (but I would highly recommend you go watch the video too!). I decided that I wanted three sets of bunting criss-crossing the room then had to calculated how many flags I will need, and what the length of each strip of bunting needed to be. 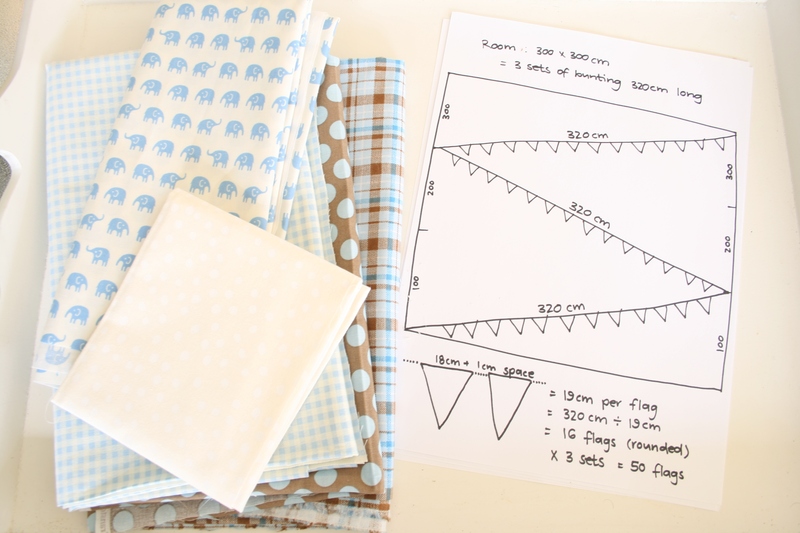 According to my calculations, in my 3m x 3m nursery room, I needed at least 320cm for each strip of bunting. With the width of each flag measuring at approximately 18cm and compensating for a 1cm space between each flag I worked out that I will need 16 flags per strip, which ended up being 50 flags in total. Fold the fabric and trace the template with fabric chalk or just using a pen (the marks will not be visible from anywhere once the flag is stitched and sewed into the bias tape). Trace and then cut out as many flags as you need. With the right sides still facing each other, sew each flag alongside the longest edge approximately 1cm in from the border. Once the flags are sewn they can be turned inside out and with the seam running down the centre of one side (this will then be the back of your flag), iron the sides flat. I used the tip of my scissors to poke the point out neatly. 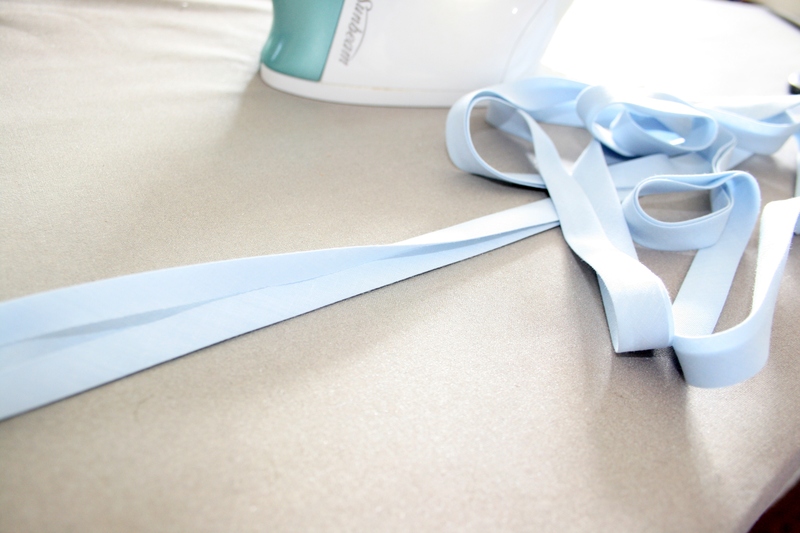 I used three different coloured bias tape (bias tape is a special type of ribbon that already has both edges folded in and ironed flat, and I get mine from Spotlight) so it gives off a really nice clean and straight edge. 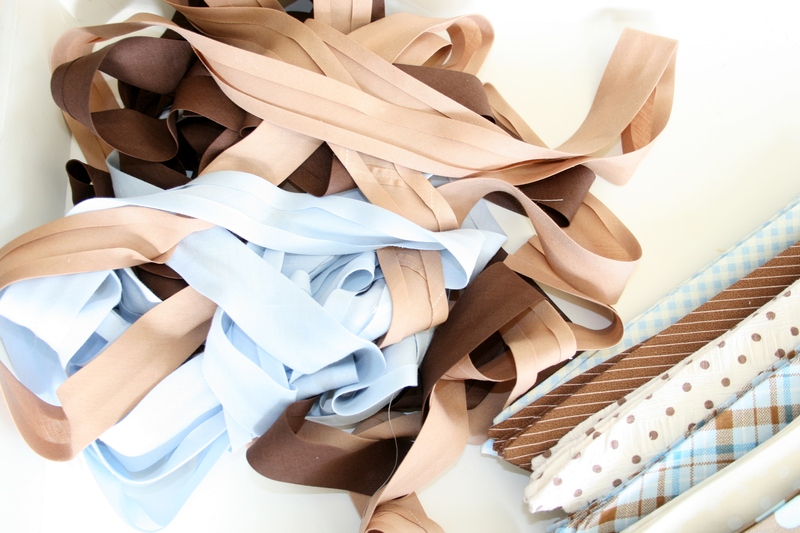 You can of course use normal ribbon as well, if you can’t find matching bias tape. Never one for fiddly or repetitive type tasks, I did not pin each flag to the bias tape before starting to sew (although this is probably the “proper” way of doing it, I just wasn’t too keen on having to pin 50 flags to bias tape!). 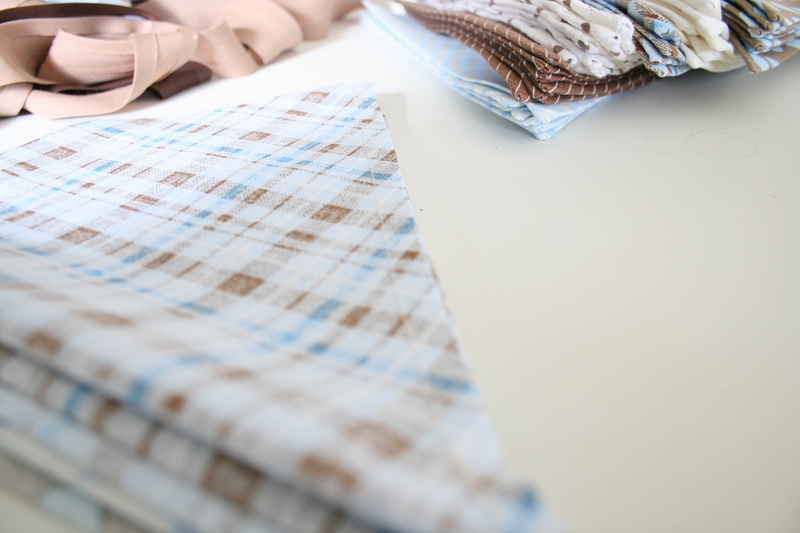 To cut out this step I fold my bias tape in half and iron in another fold, into which each flag is inserted before sewing it together. So I started to sew the first flag on and then as I am going along I insert the flags into the folded bias tape at 1cm intervals. It probably takes just as long as having it pinned into the right position, because I had to pause a few seconds when inserting each flag in the right position but it saved me from a very boring and repetitive job 🙂 Remember to leave about 30cm of bias tape clear of flags at each end to be able to hang/tie it up onto a hook. As mentioned before I will have to wait until I can hang it up in the actual nursery, for now I have just temporarily attached it to the walls of the spare room. But once it is ready to go up in the real nursery I will be using 3M clear hooks, and sticking it about 10cm below the ceiling at the intervals shown on the diagram above then tie each end of the bunting to the hooks. This was my first project on the new sewing machine, and I would rate it as fairly easy. Depending on how many flags you want to make, it also shouldn’t take too long. I have been doing mine in bits and pieces as and when I had time in the evenings between getting home from work, squeezing in a little nap and cooking dinner. But if I sat down one Saturday afternoon, from start to finish, I reckon I would have been able to get it all done in a few hours. 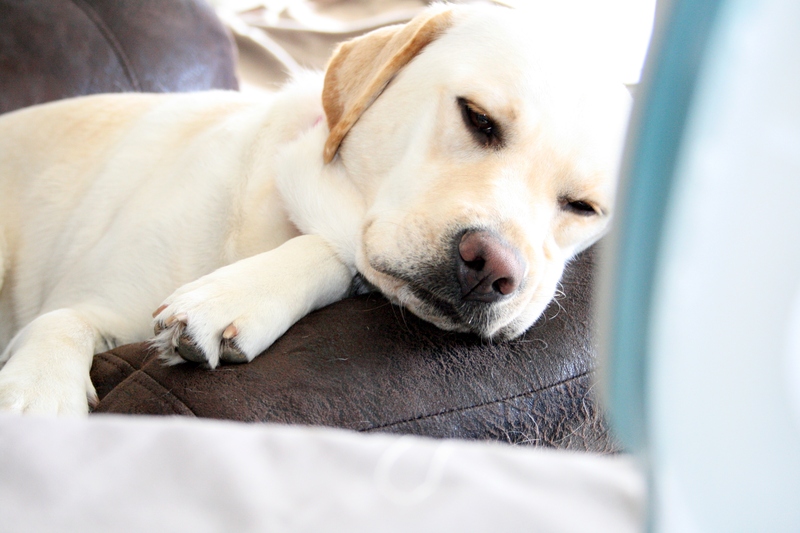 Ermmm… why is Zoe allowed to be sleeping on the couch, hmmmm? Your bunting turned out so pretty! I have been noticing bunting a lot lately and even thought about buying some on Etsy. My sister has a festive one for birthdays that she hangs up to celebrate her kids’ special days. I love the colors you chose. Thanks Shari! 🙂 I have also seen some really lovely bunting for sale, but find it so expensive for what it is and how easy it is making it yourself. Great work on the bunting! I do hope it went up well once you got into your new house! 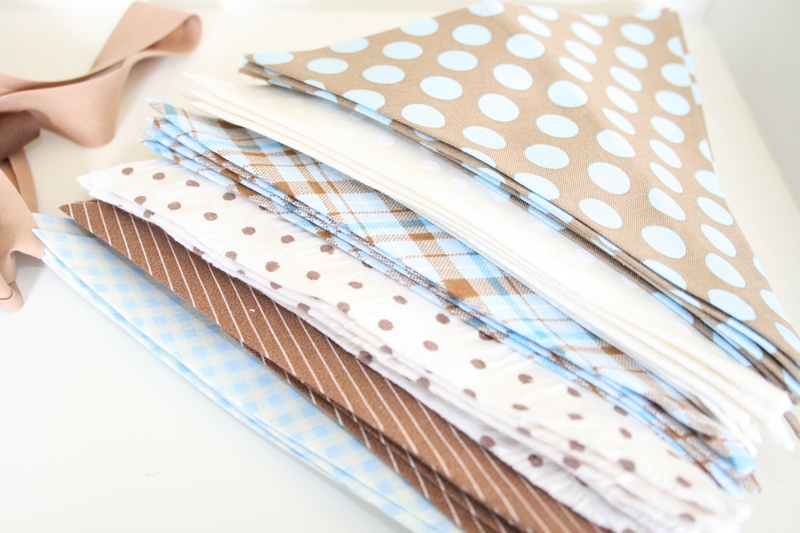 You have a great eye for fabrics (I particularly love the little blue elephants on cream background) and I’d love to know where you got them from?